Still Hamilton and Dundee cannot be separated, remaining level on points at the top of the Championship after a tense encounter. Dundee opened the scoring in the first-half through Martin Boyle's cool finish. But Hamilton rescued a point through Mikeal Antoine Curier's header after the break. And, with Falkirk defeating Cowdenbeath, the Bairns move to within four points of the top two. The sense of occasion lay heavily on this game. Before kick-off, the two sets of supporters at one corner of New Douglas Park traded insults and the mood became so ill-tempered that one fan appeared to break free of the Dundee end and move towards the Hamilton fans. Stewards soon had the incident under control, but it was a reflection of everything that was at stake. These two sides had, between them, led the Championship for all but two weekends of this season. Going into this game, they could only be separated at the top because Hamilton had scored more goals, although none in their three previous meetings with Dundee or against a side managed by Paul Hartley, who was previously in charge of Alloa. With only four games remaining after this one, the sense was that there was much to lose for both sides. That influenced the game, since it was frantic, lacking in composure or poise, and neither team was capable of taking control of proceedings. This was two teams living by their wits rather than their sense of command. Tony Andreu drilled into the side netting early in the first-half, when Hamilton enjoyed a slight edge. Jim McAlister volleyed wide from the edge of the area when Dundee managed to take a foothold in the visitors' half. The encounter seemed destined to suffer from its billing as a potentially decisive game, but Dundee eventually managed to break the deadlock. The goal was the result of resourcefulness rather than sustained aplomb, but even so Boyle had to be poised as he slipped a shot past Kevin Cuthbert after Peter MacDonald had forced the ball through. Boyle looked as though he might have been offside, but he wheeled away in celebration after a quick glance of reassurance towards the assistant referee. The visitors almost added a second just before half-time, when MacDonald hooked a volley over his shoulder but also over the crossbar. This was two teams effectively cancelling themselves out, but the goal did seem to let Dundee's confidence grow. Gavin Rae sent a shot just wide after the interval, then Boyle struck a stinging effort on target from the corner of the 18-yard box that Cuthbert pushed wide. Hamilton were still capable of asserting themselves, though, and Martin Canning ought to have equalised when the ball ran to him inside the six-yard box at a corner kick. The defender could only stab his effort over the bar, though. Dundee were trying to protect their lead, but in dropping deep they allowed Hamilton a sense of hope. They capitalised when Louis Longridge crossed from the left and Mikael Antoine-Curier used his body strength to outmuscle his marker, get to the ball first and head it beyond Kyle Letheren. Match ends, Hamilton Academical 1, Dundee 1. 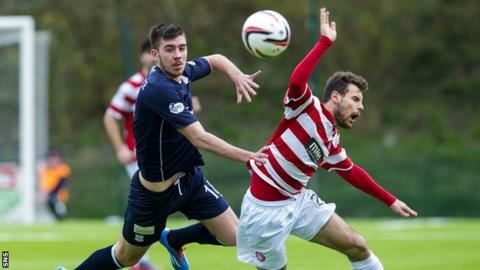 Second Half ends, Hamilton Academical 1, Dundee 1. Mickael Antoine-Curier (Hamilton Academical) wins a free kick in the attacking half. Foul by Adam Cummins (Dundee). Foul by Craig Beattie (Dundee). Attempt missed. Tony Andreu (Hamilton Academical) right footed shot from the right side of the box is close, but misses to the right. Substitution, Hamilton Academical. Grant Gillespie replaces Lee Kilday. Hand ball by Louis Longridge (Hamilton Academical). Declan Gallagher (Dundee) wins a free kick in the attacking half. Substitution, Hamilton Academical. Andy Ryan replaces Jason Scotland. Substitution, Dundee. Ryan Conroy replaces Nicholas Riley. Foul by Kevin McBride (Dundee). Goal! Hamilton Academical 1, Dundee 1. Mickael Antoine-Curier (Hamilton Academical) header from very close range to the bottom left corner. Assisted by Louis Longridge. Foul by Martin Canning (Hamilton Academical). Attempt missed. Declan Gallagher (Dundee) header from the centre of the box is too high. Corner, Dundee. Conceded by Kevin Cuthbert. Substitution, Hamilton Academical. Mickael Antoine-Curier replaces James Keatings. Attempt missed. Peter MacDonald (Dundee) right footed shot from the left side of the box misses to the right. Attempt missed. Tony Andreu (Hamilton Academical) right footed shot from outside the box misses to the right. Attempt missed. Martin Canning (Hamilton Academical) header from very close range is too high. Corner, Hamilton Academical. Conceded by Gavin Rae. Attempt blocked. Ali Crawford (Hamilton Academical) right footed shot from outside the box is blocked. Hand ball by Peter MacDonald (Dundee). Substitution, Dundee. Adam Cummins replaces Iain Davidson because of an injury. Corner, Dundee. Conceded by Ziggy Gordon. Ziggy Gordon (Hamilton Academical) is shown the yellow card. Martin Boyle (Dundee) wins a free kick in the defensive half.